The CD version comes with a total of 10 tracks: tracks 2, 4, 7 and 9 consist of short interludes of whispering voices. The time taken up by these tracks has been integrated into the tracklist shown below. Some LPs came with a part of a bone. 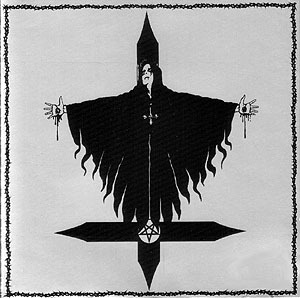 Pro Tape version released by Nails of Christ in 2005. Limited to 666 copies. LP version re-released by Noevdia in 2009, almost 100% similar to the original. One can distinguish the difference from the original and the repress of the Kruzifixxion vinyl from the manufacturing code pressed in the vinyl. The original has http://www.gzvinyl.cz in it, the second one doesn't. Original & owner of the artwork is Will "BoneS" Lee currently of Table 9 Media (at the time Bad Influence Grafixx). The cover artwork is a re-worked version of the cover of Petrified Zine #3, by Jon Thorns of Full Moon Productions. Recorded at RMK Headquarters MMI - MMII A.B. Mastered at Silent Hell by A.O.D. MMIII A.B.